As an Audi owner, you already know that your vehicle’s powerful engine performance and smooth handling make for exceptional driving experiences. From behind the wheel of your high-end Audi, everything may look good and feel even better. But normal wear-and-tear from road travel can compromise your Audi’s future performance. You can let the good times keep rolling, as long as our Audi service experts are providing all the necessary services. Your Audi isn’t like every other vehicle in our garage and that’s how we treat it–like the special import that it is. Audi engineers are constantly re-inventing ways to keep Audis on the cutting edge. And our ASE Certified techs are constantly seeking new training and certifications to stay abreast of all Audi’s innovation. The automotive industry is ever-changing which means Spotlight Automotive mechanics must use tomorrow’s tools and equipment to provide effective services today! In order to keep your Audi in premium condition, routine and factory-scheduled maintenance services must be performed. When it comes to Audi repair and maintenance services in Chicago, Spotlight Automotive is a clear step above its competitors. Spotlight Automotive is home to the local Audi service experts. With a master certified Audi technician on staff, customers can trust that we’ll deliver excellent Audi repairs and services. Over half of the vehicles we service are Audi and VW vehicles, so you can bet that we’ve experienced a repair like yours before! We offer an unbeatable 24 month warranty on Audi parts, and a lifetime warranty on labor. With a warranty like this, you can rest assured that your Audi services are being handled by the best possible team of mechanics in Chicago. Schedule Your Audi Repair Today! We invest in the most advanced service equipment to provide dealer-level Audi diagnostic services and repairs. 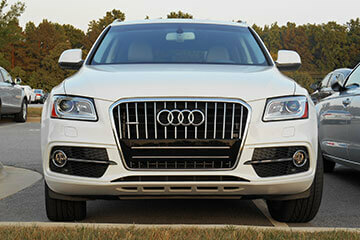 Audi drivers come to us for factory-scheduled maintenance services that help you avoid costly repairs. All Audi repairs begin with an accurate diagnosis to make sure we’re always performing the correct service. Our goal is to maintain the same standards of workmanship and professionalism you would receive at an expensive dealership. Spotlight Automotive does it all at a cost that is 40% less than the dealer. Give Spotlight Automotive a call today at 312-967-0732 to schedule an appointment. Or save time by using our convenient online scheduling system. Next time you’re in the area, feel free to stop by and meet our Audi service experts. We’ll get you and your Audi back on the road in no time!